This is Part II of our two part series on mid-range cruisers (we're focusing on bikes in the 650-900 cc range). We finish up by looking at the 2008 models in Canada with bikes from Yamaha, Honda, and Hyosung. Yamaha’s offerings in the middleweight cruiser market are a little smaller displacement when compared to Kawasaki and Suzuki. Luckily they also come with a slightly lower price tag along with it. The Yamaha cruisers come with 650cc. The next size up puts you into a 1100 cc bike. Three models are offered: the V-Star 650 Custom $7,299, V-Star 650 Classic $7,699, and V-Star Classic Canadian Edition $10,099. The V-Star Custom comes with an air-cooled SOHC 2 valve, 70 degree V-twin engine with a displacement of 649cc with peak torque occurring way down at 3,000 rpm. Power is delivered through a wide ratio, five-speed transmission and shaft final drive. For brakes you’ve got a single, two-piston, 298mm disc up front and a drum in the rear, making for inexpensive repairs and adequate stopping power. The front tire is a 10/90-19 and in the rear you have a 170/80-15. It’s got a 16 liter tank and weighs 513 lbs (wet). For suspension you’ve got a 41mm front fork and in the rear you’ve got a hard tail look with a 7 step spring preload adjustable link monocross suspension. The V-star comes with dual chrome right side mufflers reminiscent of Harley Davidson styling. The V-Star’s engine has been designed to produce its strongest torque and horsepower in the typical legal riding speeds (50-120 km/hr). It’s got a tank-mounted speedometer, odometer, and tripmeter displays. It’s got a few other small touches that are nice too such as forward-mounted rider footpegs, bungee cord tie-down points near passenger footpegs to keep scratches to a minimum, locking helmet holder, and a removable passenger seat for that custom solo look. A confidence inspiring low seat height of 27.4” means that most riders will be able to place both feet firmly on the ground. The V-Star 650 Classic and Classic Canadian Edition each share the same engine as the V-Star Custom. The biggest differences between the Classic and the Custom visually are the fenders, front wheel, and headlight. The Classic has long fenders for a look that’s well, classic. The Canadian Edition adds some unique paint, emblems, and some extra chrome bits. The Custom has bobbed (shortened) front and rear fenders with a larger wheel on the front; a 19”. The Classic and Classic Canadian Edition have a 130/90-16” in the front instead of a 19” like the Custom. - Special deep black lacquer paint with cream coloured inserts, classic gold coloured V-Star tank emblems, two tone seat with chrome studs, chrome Star accessory turn signal peaks (4), Chrome Star accessory headlight peak, Chrome Star accessory master cylinder cover. - Star series bike cover, Star series Canadian Edition ball cap, Star series Canadian Edition travel mug, Star series Canadian Edition vest pin, Star series Canadian Edition vest patch. Each of the 2008 models here have many of the same great features such as a powerful 745 cc V-twin liquid-cooled engine, valanced fenders, a broad, low-slung seat (detachable passenger section on the 750T and 750C), and wide tires rolling on traditional spoke wheels. Honda claims its bikes feature superior metallurgy, high-tech engine and chassis design, and low-maintenance features such as shaft final drive which all contribute to Honda reliability. The engine features three-valve cylinder-head design that utilizes two sparkplugs per cylinder to improve combustion efficiency and power output. The cylinders are finned cylinders to enhance appearance and give a big-bike look. They have an aluminum radiator mounted between the frame rails (for a clean look) that provides consistent engine temperatures for optimum performance and long engine life. Wide-ratio five-speed transmission and shaft driven for ease of maintenance. The suspension is pretty much the same across the board too with a 41 mm fork, 117 mm (4.6 inches) travel in the front and dual shocks with five position spring preload adjustability providing 89 mm (3.5 inches) travel in the rear. For brakes you get a relatively standard for the class, front single 296 mm disc with dual-piston caliper; rear drum. Seat height is 658 mm (25.9 inches) on the 750T, and 750C. The 750C2 has a slightly lower seat height at 652 mm (25.7 inches). Each of the bikes has a fuel capacity of 14 litres. Tank-mounted speedometer with a chrome instrument housing. The footpegs are solid aluminum with wide rubber trim bands that give it an aftermarket look. The handlebar is low and wide for a comfortable feel, and is mounted on rubber-cushioned risers to reduce vibration. Some other features include a 14-litre fuel tank, 60W/55W halogen headlight, and large custom-styled taillight and attractive retro-styled turn indicators. Steering-head lock and helmet lock provide added security when parked. 1 year, unlimited mileage, freely transferable warranty. VT750T Tourer – MSRP $10,099. 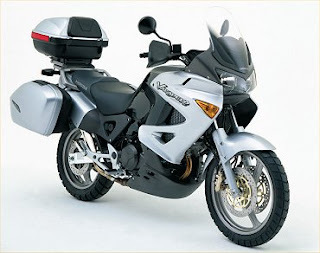 The Tourer adds a standard windshield, saddlebags and backrest. For tires you get a 120/90 – 17” front and 160/80 – 15” rear. Curb weight is not available yet on Honda’s site. For tires you get a 120/90 – 17” front and 160/80 – 15” rear. Curb weight 250 kg (553 lb) including required fluids and full tank of gas. Hyosung may not be a name that initially springs to mind for most Canadian motorcyclists. They started out producing Suzuki motorcycle designs under licence for the Korean market and started producing their own bikes in 1987. If that’s not enough to get your attention, the MSRP price of the Aquila 650 of $7,895 and very Harley V-Rod like styling might be. If you’re in the market for a sport cruiser this one is worth a look. It's got a 647cc four-stroke, water-cooled DOHC 8 Valve, 90-degree V-twin, 52.4 KW (72.1 HP), fuel tank: 16 litres. 5 Speed – belt driven. The horsepower numbers are fairly impressive when you look at the competition and combine that with a relatively light machine (claimed dry weight of 216 KG) and this bike suddenly looks and feels like a powerhouse. Korean made 41mm upside down (USD) forks in the front and a twin shock rear suspension. In the front you get a 110/70-17” tire and in the rear you have a 180/55-17”. For brakes, there isn’t too much information on the Canadian distributors website other than that its got two disc front brakes (We’ve seen reference to them being 300mm) and a rear disc brake as well. If you’re looking for a cruiser there’s a ton of bikes to choose from in the Canadian marketplace. Every major manufacturer seems to have a large range of cruisers to choose from. You can get everything from 250cc cruiser on up to a 2300cc beast. We’d have to write a book to review every model from every manufacturer. Suzuki has 17 cruiser models in its 2008 lineup as an example! 17! But if you’re looking for a mid-size cruiser in the 650-900cc range, the market thins a little. A cruiser this size will get you where you want to go and will leave you with a lot more change in your pocket than their larger brethren. Not only are they cheaper to buy but, and this can be a big expense, they’re cheaper to insure. They’ll also use less fuel which for many riders is a concern as well. You can use all that extra cash to buy some accessories to personalize your bike. Accessories will add up fast! You’ll quickly see that MSRP number climb when you want to add some personalized touches to the bike. Kawasaki offers pretty much the largest displacement mid-range cruiser with their 900cc engine. Most others offer between 650 to 800cc. So if you want the biggest of the mid-range you might want to take a closer look at Kawasaki. Kawasaki has the Vulcan with a 900cc engine which is offered in three different styles. You can get a Vulcan 900 Classic, Vulcan 900 Custom, and Vulcan 900 Classic LT. The specifications on the bikes are very similar. Each bike has the liquid-cooled 4-stroke 55 degree v-twin engine with 903 cc of displacement, 5-speed transmission, double cradle high-tensile steel frame, 41 mm telescopic fork in the front, Triangle swingarm with Uni-Trac single shock (7-position spring preload adjustment in the rear, single 300 mm disc with twin-piston caliper in the front, and single 270 mm disc with twin-piston caliper in the rear. The cruiser market typically uses either a shaft drive or belt, Kawasaki chose to go with a belt drive system for these bikes and it offers reliable performance and low unsprung weight. They each feature a very visible large black faced speedometer centrally located on the gas tank. All the models also have big double right side slash cut chrome mufflers. The LT adds some popular accessories such as a large touring windshield, and studded leather saddlebags featuring quick release snaps under chrome clasps. Some of the distinctive features of the 900 custom are it’s chrome drag-style handlebars, teardrop shaped tank, raked out front end, and that huge 21” front wheel. What about the ever-important how fat is your back tire question? They each get a 180/70-15 for the rear. The front tire on the Classic LT is a 130/90-16, the Custom is an 80/90-21, and Classic gets a 130/90-16. The Custom is the only model with a maximum power rating listed on Kawasaki’s site and it’s listed at 54 horsepower at 6,000 rpm, so the other two probably have pretty close to the same if not identical power rating. They have a listing of all the accessories you can get for the bikes but have conveniently left out the cost. Contact your local dealer for a price list before you add on too many things because you might get some sticker shock on some of those shiny chrome bits. If you’re buying a new bike you should negotiate a discount on accessories. It’s fairly common to get 15-20% off regular prices on any accessories you buy with the bike without even having to ask. Vulcan 900 Classic LT - 18 liter tank, 595 lbs dry weight, 24 mth warranty. At first Suzuki’s cruiser line-up takes a little more effort to get a handle on because they don’t use the cubic centimeter (cc) engine displacement size most people are accustomed to, or maybe that’s just me. The navigation of the site makes it a little challenging to compare models unless you use the “choose a model” feature in the shopping tools portion of the site. If you look closely you’ll see that Suzuki uses the cubic inch measurement within the model name so if you’ve got a 50 in the name you get an 805cc engine. An 805cc engine is what you’ll get in the Boulevard S50, Boulevard C50SE, Boulevard C50 T, and Boulevard M50. The S50 comes classic cruiser styling and the lowest MSRP of the bunch at $8,299 and with that you get the same engine as each of the other bikes, a powerful 45 degree liquid cooled v-twin engine that produces lots of low end and mid-range torque. The front wheel is a bit larger than the 16” that comes on the others, with the S50 you get a 19” front wheel. You get a speedometer but it isn’t tank mounted and foregoes the LCD fuel gauge. Instead of dual pipe right side chrome mufflers, you get a single pipe right side chrome muffler. The rear-suspension is also a notable difference on the S50 where you get Swingarm, oil damped, 5-way adjustable spring preload rather than the hard tail styled 7-way adjustable link type suspension. You also get a smaller tank at 12.0 Liters. The S50 is the lightest model on the scales with a dry weight of 443 lbs. The M50 comes with a link type rear suspension with truss style swing-arm and a single shock absorber with 7-way pre-load adjustability. This design gives it a stylish hard-tail appearance with the comfort of a soft-tail. Shaft driven; you won’t have worry about the maintenance and grime associated with a chain. 16” front and 15” rear tires. You’ll get a single 300mm front hydraulic disc brake up front and a single drum in the rear. It’s got low-rise bars, sculpted rear fender and slash-cut chrome mufflers so you’ll feel right at home with the custom cruiser crowd. The tank is a bit smaller than the C50’s at 15.5 Liters. (540 lbs dry weight) The front tire is a 130/90- 16 while the rear is a 170/80-15. The C 50’s come with the same fuel injected v-twin engine as the M50 (single over-head cam, four valve per cylinder) mated to a five speed transmission but feature more classic cruiser styling. Crave the open road? You may want to take a closer look at the C50 T or C50 SE with their aerodynamic windshield and backrest to keep you and your passenger comfortable for those long journeys. The C50’s feature a raked front end, wide pull-back handlebars, 17.0 liter teardrop tank, valanced rear-fender, and dual right side chrome muffler. These bikes are equally capable for the long haul or the city street riders. Each of the three models has a spoked 130/90-16 in the front and a 170/80-15 in the rear with polished aluminum hubs, a tank mounted speedometer with LCD fuel gauge. Suzuki’s website does show a wide range of accessories available for each of the machines but with no pricing information. Suzuki’s standard 12 month warranty applies to each of the bikes. Here's a link to Part II of our coverage of other manufacturers with mid-range cruiser offerings. Kawasaki Concours 14 - The Ultimate Touring Machine? New for the 2008 model year lineup is a blisteringly fast and powerful touring machine - the Kawasaki Concours 14. Don't mistake this bike for a dull touring machine - It knows how to go fast and do it in comfort! One need only look at the power plant to see why this is a go fast machine; the C14's power plant is borrowed from the ZX-14 sport bike and is good for about 156 hp in the C14! The C14 is not just a ZX-14 with bags strapped on though. The Engineers at Kawasaki tweaked the 4 stroke, 1352 cc inline 4's (16 valve DOHC - digital ignition and liquid cooled) power output to smooth out the engine to make those long haul adventures a little more bearable (you still get a slipper clutch though!) The engine uses variable valve timing (first in its class) that adjusts the cam profiles, making its power delivery smooth and linear. Despite the standard issue touring bags which will fit a full face helmet - the cornering bank angles are comparable to the ZX-14. The slipper clutch helps eliminate lunging on downshifts and should be a well received feature. This bike has a lot of really great features so settle in - I'm going to cover them as briefly as possible but the "Neutron Silver" body panels disguise a bit of engineering bliss. First up and one of the most obvious features of the bike is the fact it's got no chain - it's a shaft drive. More specifically, it uses a four-shaft design which Kawasaki refers to as a "Tetra-Lever shaft drive system" which is said to significantly reduce driveline lash. Driveline last is caused by slack in the driveline. If there's a lot of it you'll feel or hear a clunk in the transmission. Kawasaki says the Tetra-Lever system delivers the same ride quality as a chain driven bike. Initial reviews seem to indicate the system works well. - The windshield is electronically adjustable. - Body of bike is aerodynamically designed to make wind "flow" around the driver and passenger. - KI-PASS system (Kawasaki's Intelligent - Proximity Activation Start System) so you can leave your key in your pocket! - Optional non-linear ABS system. - Cigarette lighter style DC power outlet in the cockpit to power accessories such as GPS systems. - Standard panniers are slim and close fitting for mass centralization. - Tire pressure sensors (front and rear) with an instrument panel display. - Small glove box on the fuel tank cover. - 4-2-1 exhaust on the right hand side (gives you a nice view of the tetra lever on the left). From what I've read you can leave the key in the bike and forget about it basically - you've got a small transponder fob that goes along with the key. When the transponder (with its unique corresponding signature as the key) is within 5 feet of the key you can start the ignition. When you walk away from the bike with the fob in your pocket the bike will go into lockdown mode when you get out of the 5 foot range. It's becoming a common feature in automobiles and it's beginning to find its way onto high end motorcycles. MSRP is $17,799 w/o ABS or $19,099 with it. The frame is monocoque aluminum that wraps over the engine. It looks pretty high-tech! The C14 is not a light machine but respectable for this category at a dry weight of 275 KG without ABS (ABS adds an extra 4 KG bringing it up to 279 KG). The tank is 22 L and the seat height comes in at 815 mm. The suspension in the front is an inverted cartridge fork and in the rear you're got the Tetra Lever with a single gas-charged shock with rebound damping and remote pre-load adjustability. The C14 has a 36 month warranty but you can pay for an extended "Good Time Protection Plan" warranty for additional peace of mind. Tall riders may want to spring for the taller windshield that is 70 mm taller than the stock windshield and offers approximately 22% more surface area. The only negatives I've been able to find out about the bike is that it is a little heavier than some of it's competition; the BMW K1200GT and the Yamaha FJR1300 for example but it's also got a bit more horsepower than both those machines too. Some may find the mirrors don't give them a really clear view of what's behind them, noting that one reviewer seemed to indicate that they could see the panniers really well but that's about it. I've also been reading that the bike kicks out some heat! You'll need to wear proper gear (no shorts on this one!) to keep comfortable apparently. 2010 Update: It looks like Kawasaki have been listening and they've made some key changes for 2010. They made sure to address the heat and mirror complaints that many people had. The mirrors have been adjusted in 2010. They've been raised up 40 mm. New bodywork too - this helps dissipate heat much better than before according to Kawasaki. 70mm taller windscreen, and wider too. It's also got memory so once you've discovered a sweet spot you find comfortable you can program it into the computer so that it returns to that position automatically when you re-start the bike. But as a whole the bike seems to be a great machine that's going to have a lot of touring folks lining up at the Kawasaki dealerships! First up - the Varadero is a BIG adventure tourer styled bike with a liquid cooled and fuel injected 996 cc 90 degree V-Twin (4-stroke 8- valve). You won't have any trouble keeping up traffic with this big v-twin with right around 95 hp. You might have guessed it has 6 gears, and you'd be right; and it's got an o-ring sealed chain for the final drive. I've seen seat heights from 838mm to 845mm -the official word from the Honda UK site is that it's 838. You'll have 181 mm of ground clearance should you decide you want to take it off the pavement. The tank will take up to 25 litres (that's 3 more than the Suzuki V-Strom 1000 or 650). When you get down to 4 litres remaining the warning light reserve comes on. Some reviews suggest that the Varadero is a little thirsty though so you might have to stop for gas a little sooner than you might expect; particularly with a lot of city or aggressive driving. Dry weight is listed at 244.2 kg (incidentally - I've read slightly lower dry weight's in reviews so it might be best to reserve judgement until official news comes from Honda Canada). The V-Strom 1000 is 207 kg. That's a whopping 72+ lbs of pudge that the 2007 UK spec Varadero has over the V-Strom. Rider reviews seem to indicate the bike is big but still feels much more nimble than its weight might indicate. The wheels are hollow-section triple-spoke cast aluminum suggesting that its got a street bias and isn't intended to be taken too far off-road. 110/80 tire's in the front and 150/70's in the rear. Front suspension in a 43mm telescopic fork with 155 mm of axle travel. In the rear you get a pro-link damper with 40-step spring preload (and stepless rebound damping) adjustment, 145mm axle travel. For brakes - ABS front and back; 296 x 4.5 mm dual hydraulic disc in the front and 256 x 5mm hydraulic disc in the back. Both have combined 3-piston calipers and sintered metal pads. Touring should be a comfortable affair on the Varadero though and it can be fitted with factory accessory bags. It's got a well padded seat and a tall windscreen to keep you comfy on those long journeys and to protect you from the elements. Haven’t seen any pricing information yet but it should come in close to the Suzuki V-Strom 1000. If you take the price of the 2007 Varadero from the Honda UK site; a direct conversion would equate to roughly $14,460 CDN. The MSRP on a 2008 V-Strom 1000 (no ABS) is listed at $11,999. Edit (Feb 18/08): An astute reader indicated a slight flaw in the direct conversion (speculative) pricing we've published. "European prices include the tax already. The £7,299.00 quoted on the Honda site includes 17.5% tax, therefore the before tax value of the bike is about £6211+ change and equates to roughly C$12,200.00 @ 1.97 exchange rate. Which is spot on with the V-Strom pricing." I'm sure many are hoping for this type of price in Canada. Keep your fingers crossed! Thanks for the comments Chris. If you search online forums and listen to motorcycle podcasts you'll see/hear grumbling about Honda and how their lineup hasn't really shown much in the way of innovation or listening to the wish lists of customers (a lighter - more powerful VFR800 for example). Some say that bringing a bike to Canada that's been around since 1999 is another sign of that lack of vision. Say what you want, but Honda has built a reputation of making reliable machines and there will be buyers for the Varadero. The bike has a solid reputation and for those looking for a big comfortable touring bike this one is worth checking out. 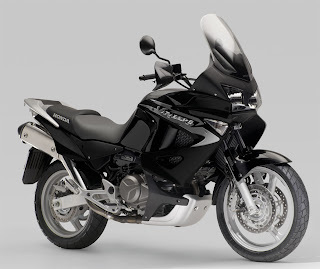 Edit (March 22/08): Pricing information for the Honda Varadero in Canada was released on Friday March 21 in a newsletter to people who subscribed on the Honda Canada website. It'll have a base MSRP of $13,999.